In light of the needless murder of a lion named Cecil by an American trophy hunter in Zimbabwe, another story has emerged that is equally as deserving of global attention. 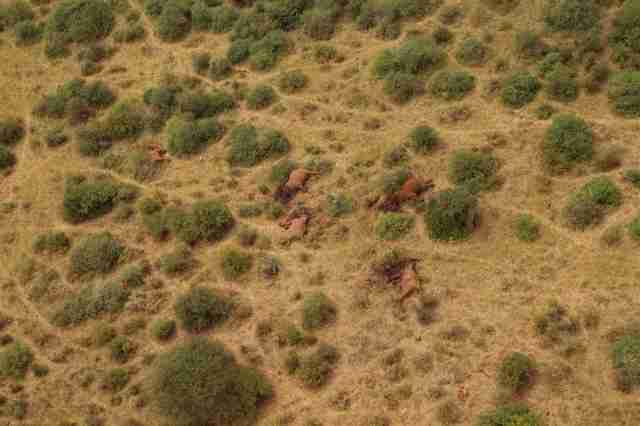 On early Tuesday morning, following reports of gunfire in Kenya's Tsavo West National Park the evening prior, rangers discovered a shocking scene of carnage and death. There, five elephants were found shot to death all in close proximity by illegal hunters, their faces hacked away so their ivory tusks could be removed - an all-too-common horror carried out in a sickening scale on a single night. "All killed to satisfy a demand for ivory from people that wish to display and wear something that only has real value to an elephant," wrote the David Sheldrick Wildlife Trust. "We talk of an elephant being killed every 15 minutes for its ivory, a shocking statistic, yet in this tragic incident, 5 elephants were killed in a minute!" Three poachers suspected in the crime have reportedly been apprehended, but the massacre will continue to be felt for a lifetime - by one tiny victim who was lucky enough to escape. Days after the elephants' bloodied bodies were found, wildlife officials found and rescued a lone calf left orphaned by the attack. 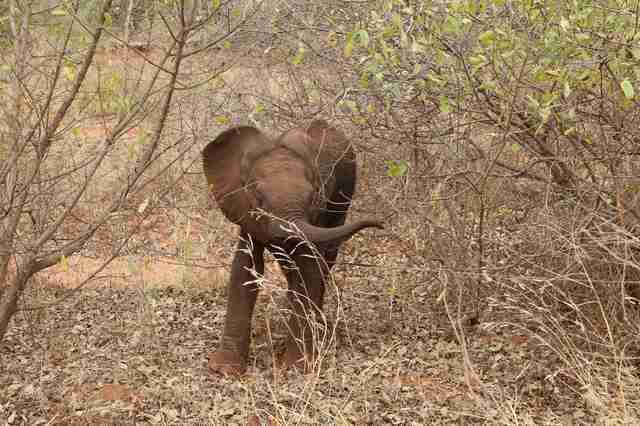 The youngster, only 6 or 7 months old, too young to be of value for ivory, is believed to have been present when the illegal hunters arrived and slaughtered his family. 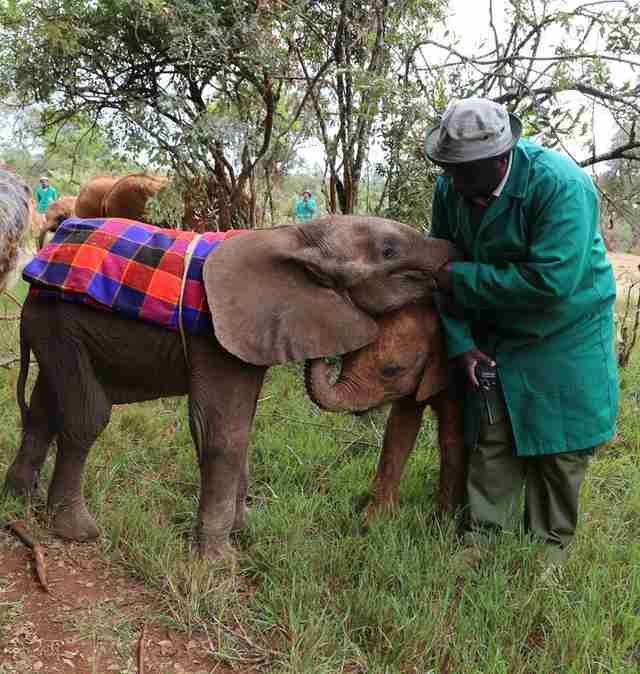 The calf was transferred to the David Sheldrick Wildlife Trust's elephant nursery to be raised among dozens of other orphans like himself. "Surprisingly, despite his ordeal of having witnessed his whole family gunned down at the hands of humans, he has been friendly from the outset, needy of company and attention and clearly grateful to have been saved. We have called him Losoito, after the name of the hill close to where he was found," the group wrote. "We will do all in our power to help Losoito overcome his harrowing ordeal, for it is impossible to imagine the emotional trauma he has endured in witnessing the murder of 5 members of his family." 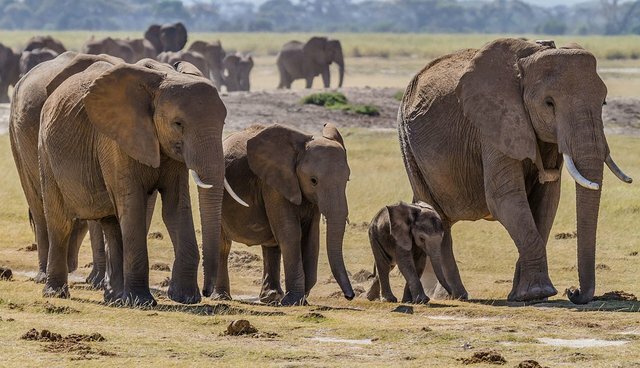 While trophy hunting remains a serious problem, claiming the lives of hundreds of lions every year, the plight of African elephants is far more dire. Between 2010 and 2012 alone, approximately 100,000 elephants were slaughtered by poachers - which, if current trends continue, could see them go extinct in as few as 10 years.